I don’t know about you but sometimes I need a quick card at the last minute. This monochrome CAS card fits the bill. What is CAS? It means clean and simple with minimal layers and minimal embellishments. The best part? They’re usually quick to make. This card can be re-created in under 10 minutes! 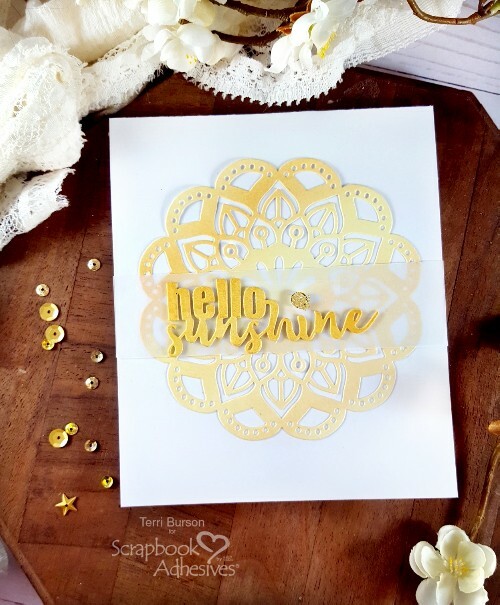 Hello, Terri here, with a short tutorial and creative ideas to pull this easy card together. Everything that I used on this card was already in my craft stash, which is an added plus when creating quick cards. My card dimensions are a top-fold, scored white card 5.50H” x 4.75W”, however, an A2 size card will work as well, if you have some on hand. Also in my stash, is some pretty watercolor paper. 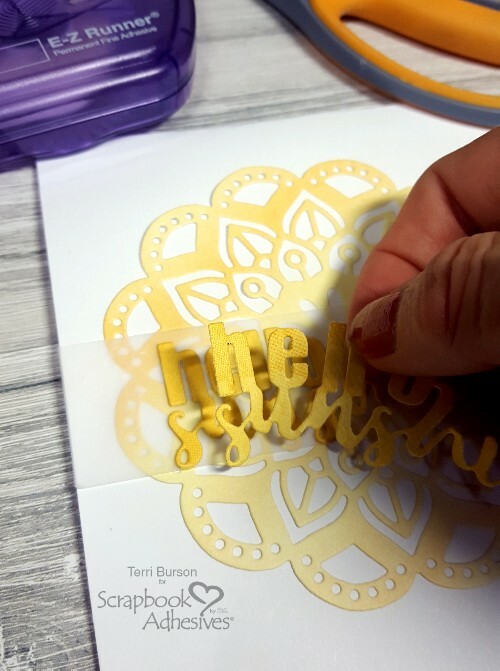 I chose a yellow monochrome theme so my sentiment and doily die cuts will all be created using this paper with the Adhesive Sheets 6×12 inch. Trim a 4 .50″ x 5.50″ piece of colorful paper along with a matching section from the adhesive sheets. Peel the backing from the Adhesive Sheet and apply to the back of your paper. 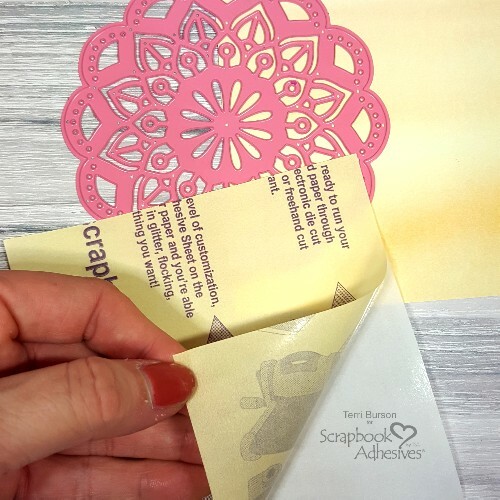 Using a doily die or other similar decorative die, run your adhered paper through your die cut machine. As an added bonus, when peeling the backing off your doily, most of the the tiny cuts will come off as you peel. Yes, I’m going to proclaim that loud and clear, for all to hear! 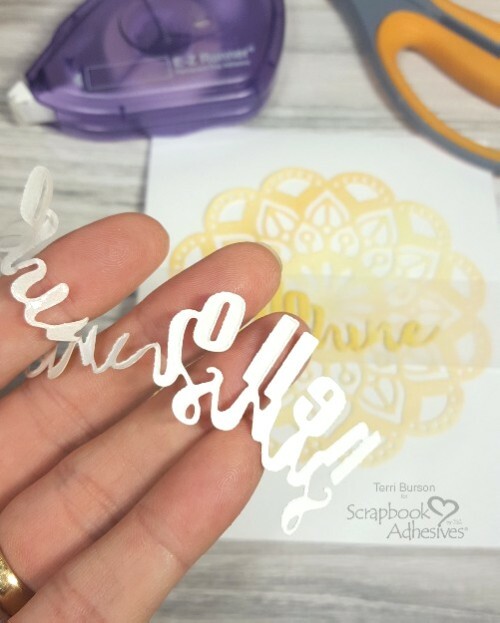 I love the E-Z Runner® Permanent Fine Adhesive Dispenser! Trim a piece of clear or white vellum measuring 4.75″W x 1.25″H. Run a bit of Permanent Fine on the back of your vellum and attach to the center of your decorative die cut (doily). The Permanent Fine adhesive disappears and is invisible in about 24 hours! Next, peel the backing off your sentiment die cuts and adhere one on top of each other, adhering a bit offset from the center of your vellum. This gives some dimension and makes the sentiment pop a bit more. Lastly, grab one of the small circles from the new 3D Foam Circles White Mix. 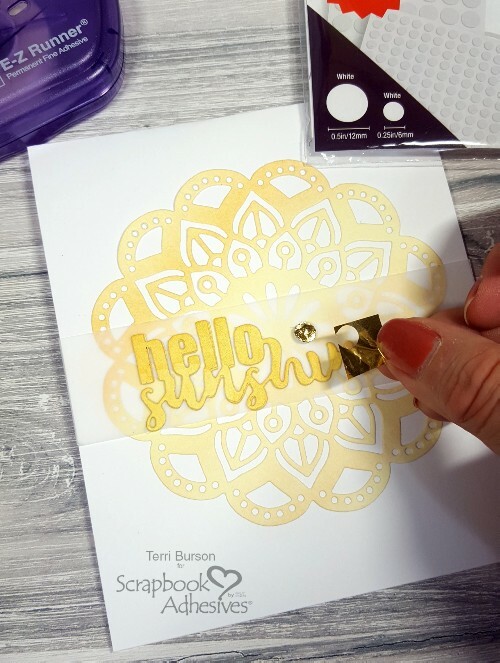 Use it as the dot for the letter “I”, apply a small piece of gold foil from the 3D Foam Creative Embellishment Kit, shiny side up. Peel and …. voila! A great way to Wear Your Adhesive On The Outside! Thanks for popping in today. I hope this has inspired you to create with what you have. If you’d like to see the full product list, be sure and visit my blog, Waving My Wand. See you next time! This entry was posted in 3D Foam Circles, Adhesive Sheets, Adhesives, Cards, Crafts & Tutorials, E-Z Runner® Dispensers, Permanent Adhesive, Seasonal Craft Ideas, Spring, Summer, Tutorial, Wear your Adhesive on the Outside and tagged 3D Foam Circles White Mix, 3D Foam Creative Embellishment Kit with Foil, Adhesive Sheets 12x12" (25 sheets), Adhesive Sheets 12x12" (5 sheets), Adhesive Sheets 4x6", Adhesive Sheets 6x12", Bazzill, Bo Bunny, Card, CAS, Core'dinations Cardstock, E-Z Runner Permanent Fine, Hello, Lawn Fawn, Monochrome, Ranger Ink, Spellbinders Paper Arts, stamplorations, Terri Burson, Tutorial. Bookmark the permalink.